Back in 2009 Portland International Raceway (PIR) decided to create a special night when only bicycle riders would be allowed to circle the 2-mile track to take in the extensive Winter Wonderland display. This event is called Bike the Lights, and it has been held every year since. I’ve been to all nine of the previous occurrences and thought a recap would be nice for this 10th anniversary coming up on November 27 from 5:30 to 9:30 pm. For me, the most memorable year happens to be the first, when the temperature was 25 degrees with a 15 mph wind blowing. But even under those conditions a huge crowd showed up. Portland bike ride leaders Carye Bye and Ester Harlow had a group ride up to PIR for the well-publicized event. And Pedal Bike Tours also had a group ride to the event that same year, thus starting another new holiday tradition. Every year since there has been at least one group bike ride to Bike the Lights where Portlanders are greeted by a parade of holiday decorated bikes and sound systems on their way to the lights. It’s like a Pedalpalooza ride, just six months later. One remarkable occurrence (at least for Portland) is that it has not rained during the event over the past nine years. But there were times when it rained earlier in the day, so the track was still wet. And one year it started drizzling just after the event was over. In 2013 Portland had a good snow the Friday before, but it was gone by the Monday evening of Bike the Lights. And there was another year (2015) where it would have been raining, but it had been raining so hard that the racetrack was flooded. PIR thus canceled the early December date and rescheduled Bike the Lights for December 28 of 2015. That made for a pretty light attendance, perhaps because fewer people were interested in taking in holiday lights after December 25. We’ll have to see if the rain-free weather holds out for another year! For reference, here are the weather conditions on each of the previous nine years. Thanks to Jonathan’s extensive archives, you can click on the year link for information pertinent to that particular year. A substantial change in Bike the Lights took place in 2016 when the event was moved backward in time to be in late November rather than in December. This meant that it was over with before a lot of people even had it on their radar. And this happened the year after it had been rescheduled to December 28. So that pent-up demand over two years’ time caused a lot of people to come to Bike the Light in 2017. It was the biggest crowd I remember seeing since 2009. This year Puddlecycle is leading a group ride to Winter Wonderland that will follow a flat/downhill 4-mile route to PIR using quiet streets and the Columbia Slough Trail. Meet us in Dawson Park at 6 pm if you’d like to ride along! 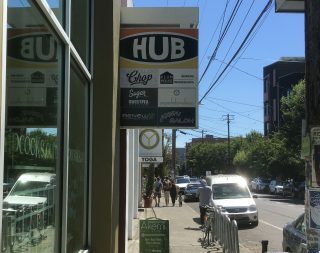 Did you know the Hub Building on N Williams used to be a bicycle-making factory? This post was submitted by BikePortland subscriber Tom Howe. Everyone who regularly visits BikePortland knows its value as a source for bicycle-related news in the Portland area. I can’t count the number of things I never would have heard about if not for visiting this site a few times a week. But something that’s easy to overlook is the value of BikePortland as a research tool for bike news that has taken place in the past. Jonathan has been at this for over 13 years now, so learning about or reviewing anything that has happened since 2005 is as easy as typing a search into the box under the magnifying glass at the top of any page on the site*. This value was really driven home to me recently when I came to the site looking for some historical information. Not only did I find what I was looking for, but I learned a lot more about a past bike controversy a dozen years ago that I only remembered a little about. I started my search with the word “Kinesis” as I had recently acquired a new bike frame from the Taiwanese company and I remembered these frames were once built right here in Portland. So all I really wanted to know was where that assembly facility was located, but once down the rabbit hole, I learned a lot more. 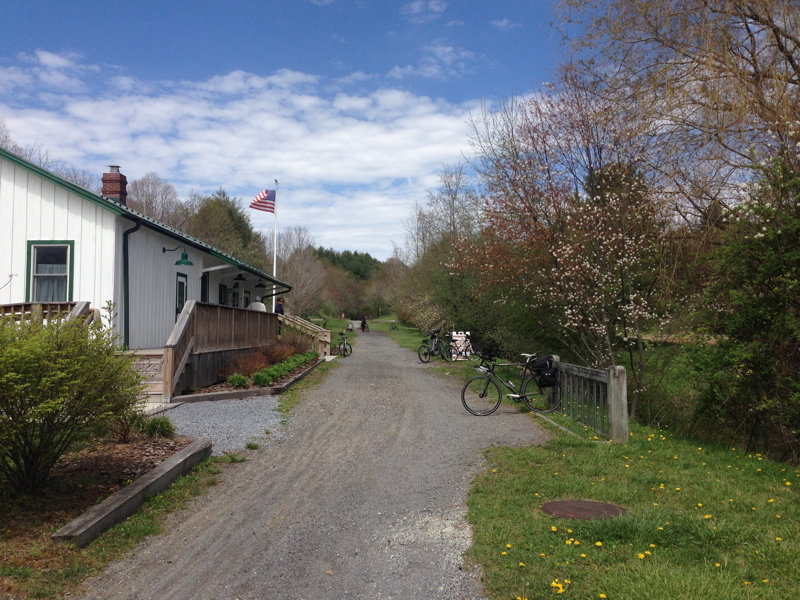 The Whitetip Station along the Creeper Trail. This guest post is by Tom Howe, the man behind the Puddlecycle ride series. His last post was about biking to the solar eclipse. The Salmonberry Trail is a project that will make use of a derelict rail line from the current end of the Banks-Vernonia Trail all the way to the Oregon coast. The trail has been in the planning stages for a long time, but if Virginia’s experience with the state’s 34-mile Creeper Trail is any indication, Oregon would do well to complete the Salmonberry sooner rather than later. Back in the 1980s, the Virginia Creeper was itself an abandoned rail line that the US Forest Service decided to make into a recreation trail. Given the very rural nature of the area, this idea was met with some skepticism, but the trail has become wildly successful beyond anyone’s expectations. The trail holds special significance to me, as I once lived in Abingdon just a few blocks from the abandoned rail line. As neighborhood kids, we’d go over to the tracks and walk over the high trestles as a foolish/daring/scary thing to do. The only thing I ever saw on the tracks was a Drasine – a motorized vehicle about the size of an automobile. If you had told me at that time that those tracks would one day be a bike path with 250,000 riders annually, I wouldn’t have believed it. That figure is over 25 times the combined populations of the two towns along the trail – Abingdon and Damascus. Trail-related tourism is estimated at $25 million per year, and each overnight visitor spends about $700 in the area. This post was written by BikePortland Subscriber Tom Howe. The August 21 solar eclipse may be four months away, but now is the time to start planning if you want to experience it in the Path of Totality as part of a bike camping trip. A few days ago Oregon State Parks released a thousand extra campsites which were all reserved in about an hour, and many of those sites are not even in the 70-mile wide path of the total solar eclipse where the sun’s corona will be visible. Eclipse expert Xavier Jubier has created a neat zoomable map showing the eclipse path. 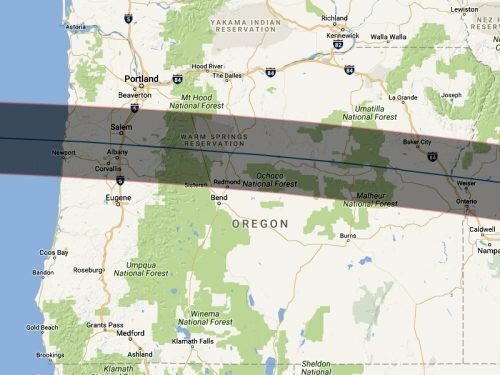 Clicking anywhere in the path of totality on this map will give that spot’s length of the total eclipse, which in Oregon tops out at just over 2 minutes as the moon’s shadow races across the state. But camping is still available at private sites outside the state park system. One notable location about 40 miles from central Portland and well within the path of totality is the Wooden Shoe Tulip Farm near Woodburn. Here is a zoomable map that shows a rural bike route down to the tulip farm from Portland. Has Portland’s Lack of Gated Communities Contributed to Its Cycling Success? Recently I was planning the route for a Puddlecycle ride called “The Two Bridges” that goes over both the I-5 and I-205 bridges staying on the Vancouver side of the Columbia River. The goal was to stay as close to the river as possible. This was initially easy, as Vancouver has the Renaissance Trail that you can hop on right after coming off the Interstate (I-5) Bridge. The trail seemingly ends a mile later at the Kaiser Shipyard where they built Liberty ships during World War II. But you can ride to the North around that yard on a wide sidewalk, and the trail picks up again on the other side.